For the Sci-Fi nerd at heart, this easy to make rocket card will be a fantastic craft to give for Father’s day or to the boys in your life! 1.Print out the free template, draw around it onto two separate sheets of Dovecraft white card stock and cut out. These two pieces will make your rocket ship! 2.Find the yellow sheet within the First Edition Pick n’ Mix 8x8 Paper Pad and place it onto your desk facing down. Take your first rocket shape, place it over your sheet, draw around it and carefully cut around the shape with a craft knife. Glue your yellow sheet onto your rocket shape. 3.Now we are going to decorate the inside of the ship. Follow the previous step and cut around a coordinating sheet of Pick n’ Mix paper. Adhere this to the front of your second, rocket ship shape. 5.Score across the line indicated on your template on the second rocket ship shape. Adhere the front and back of your rocket ship above the score line with Dovecraft Perma Fix Tape. 6.Finish by embellishing the rocket with a line of Dovecraft gems along the bottom strip at the front of your card and adhere two larger gems on either side of the strip above it. 7.To give it a sentimental touch, you could add a special photo in the window of the rocket! We adore this card shape, especially alongside the Pick n’ Mix papers! They really are great for giving it a ‘spacey’ feel. You could even die cut an astronaut from the First Edition Space dies as shown in the picture to put inside your card! 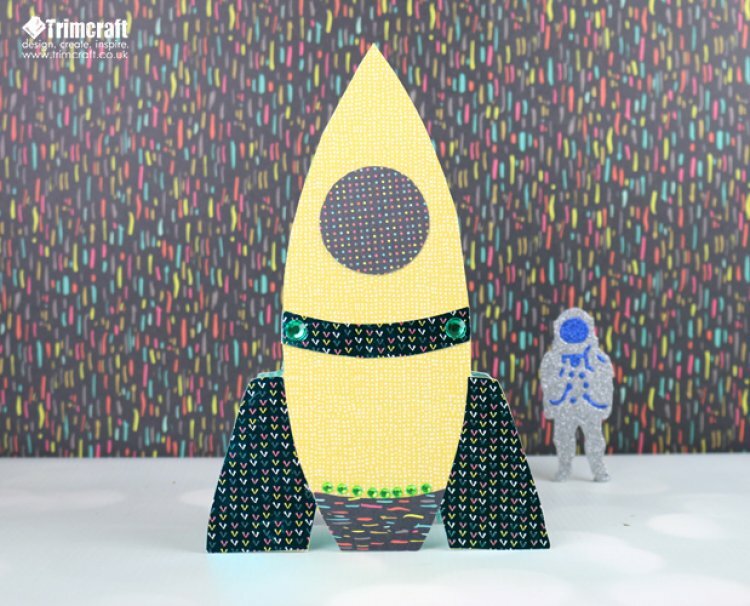 We would love to see your rocket ship makes so remember to upload them to the inspiration area and when uploading to social media, to #Trimcraft!